Having your pooch by your side when you're lounging at the beach sounds like the perfect day, but consider these safety tips first. Summer is one of the best seasons to get outside and get active with your dog, but we all know warm weather has its hazards when it comes to your furry best friend. Taking them for a dip in the ocean might seem like the ideal remedy, but in reality, it could do more harm than good if you aren't careful. Take note of the following five safety tips so that your time in the sun is fun for your pup, too. Over the weekend, a man in Florida took his pup to the beach, and just a few days later, the pet died from saltwater poisoning. 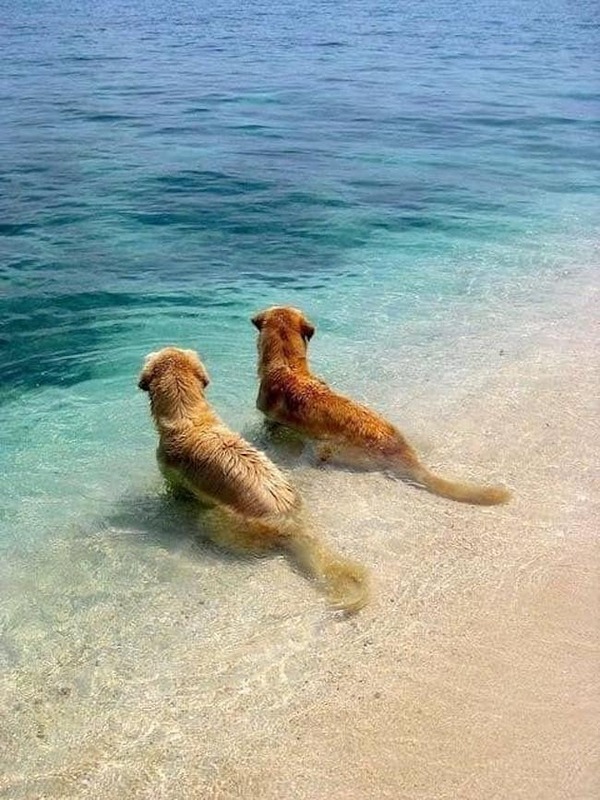 To prevent ingesting saltwater (and to help your dog stay cool), pack fresh water. This will help keep your pooch hydrated so that he or she isn't tempted to lap up the other stuff. This tip might sound silly because most dogs are covered in fur. But according to Animal Planet, short-coated and light-colored dogs, hairless breeds, and pups with pink noses can experience sunburn the same way humans do (even pets with thick hair can burn their noses). So, invest in sunscreen made for dogs, but avoid all sunscreen that contains zinc because it is toxic to your pooch if ingested. Simply apply the sunscreen to your pet's ears, nose, and anywhere else that will be hit by direct sunlight. Reapply after they go for a swim. Dog-friendly sunscreens can be found online and at many pet stores. There are underwater dangers to your doggo that you might not think of, including sharp rocks, coral, and jellyfish. It's hard to prevent a cut or a sting, so pack a few essential first aid items just in case, such as cotton balls, peroxide, bandages, and ammonia (used for stings; remember to dilute with water before you apply it). Not all dogs thrive in the water. Things like surfboards, jet skis, or large waves might frighten your pooch. Instead, try to play with your pup in calm water. And in case your dog isn't the strongest swimmer, purchase it a lifevest. That way, he or she won't become overtired, and you can have peace of mind if swimming simply isn't their forte. After a day in the sun and swimming in the ocean, it's important for not only you to have a comfortable place to relax, but also your pet. Shade can help keep them cool and prevent them from overheating, getting a sunburn, or burning their paws on hot sand. So try to find a shaded area to set up camp, or consider bringing an umbrella or tent for when you both are ready to take it easy. Did any of these tips surprise you? Let us know in the comments below!